If you write a blog you obviously want people to read what you write and even better you want to inspire discussion. I was therefore very happy when Duncan Brown sent me his two latest blog posts, which both are inspired by stuff I have written. Duncan’s posts are very interesting. The first post – Shocking supply and volatile demand – uses a (crude) method I developed to decompose demand and supply inflation. 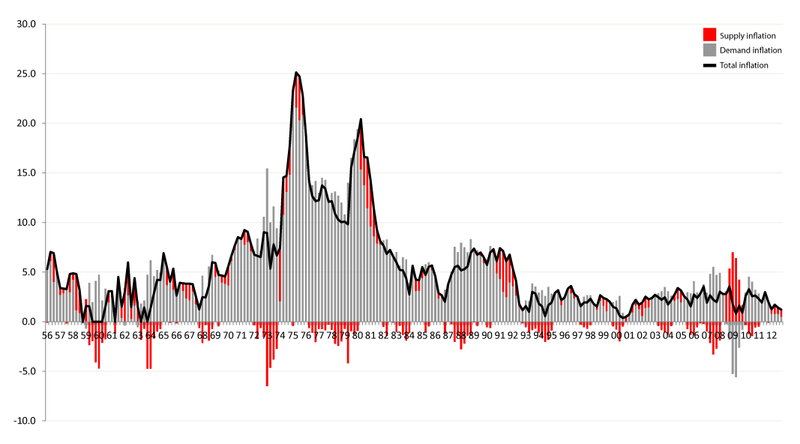 Duncan utilizes this method – Quasi-Real Price Index – on UK data. The second post – In the 1950s, Rab Butler sets an NGDPLPT mandate… – also uses one of my ideas and that is to look a what inflation historical would have been had the central bank had an NGDP target. Duncan looks at the UK, while I earlier have looked at the US. I first time suggested that inflation could be decompose between supply and demand shocks with what I inspired by the brilliant David Eagle termed a Quasi-Real Price Index in a blog post in December 2011. (3) Shows that consumer prices (P) are determined by the relationship between nominal GDP (N), which is determined by monetary policy (M*V) and by supply factors (Y, real GDP). Where p is US headline inflation, n is nominal GDP growth and y is real GDP growth. Where yp is the permanent growth in productivity and yt is transitory (shocks) changes in productivity. Duncan uses this method on UK data and I must say that his results are vey interesting. Here is a graph from Duncan’s post on the decomposing of UK inflation. As a Market Monetarist it is hard to disagree with Duncan’s statement. However, it should certainly also be noted that Duncan’s results give reason to think that the nature of the present crisis in the UK economy to some extent is different from the crisis in the US or the euro zone economies. Hence, it seems like the present subdued growth in the UK economy to a larger extent than is the case in the US or the euro zone (overall) is due to supply side problems (Weak demand is the primary problem, but supply issues seem more important than in the US). In that sense the UK economy might share some similarities with the Icelandic economy. See my earlier post here on why the Geyser crisis to a large extent was caused by an supply shock rather and a demand shock. In his second post Duncan tells the counterfactual story of what inflation would have been in the UK since the 1950s if the Bank of England had been targeting an 5% NGDP growth path. The method is similar to the one I used in my post The counterfactual US inflation history – the case of NGDP targeting. You can see Duncan’s counterfactual inflation data in this graph. Duncan’s results for the UK are rather similar to the result I got for the US. However, it seems that UK inflation under NGDP targeting than would have been in the case in the US in recent years. That do indicate that that the low growth in the UK economy to a larger extent than is the case in US. That, however, also mean you need lower demand inflation to achieve the Bank of England’s present 2% inflation target. It is not all I agree with in Duncan’s two post – for example I think he misinterprets his results to mean that the primary shocks to the UK economy has been supply, while I think his results in fact shows that demand shocks have been the primary driver of the UK business cycle – but I would nonetheless recommend to all of my readers to have a look at Duncan’s blog. It’s good wonkery. Thanks for the feedback Lars – good to get noticed! On our difference over the relative importance of supply shocks, we’re probably not so far apart. For me, it’s the unfortunate interaction of policy response with supply shocks that has made such a big difference to the UK’s macro history. So, having let demand get out of control, we have the 1973 oil price shock and we respond with a massive inflationary policy loosening – overdoing it, and causing much damage. We then have to try to bring demand-side inflation under control amidst the aftermath the 1979 oil price shock, which meant a double-hit. And then we shadowed the DM amidst the 1980s boom, resulting in a demand-side injection, and then we joined the ERM as it became deflationary while we were hit by another supply shock. I’d agree that demand-side policy has been the main cause of macroeconomic instability, but the largest shocks were supply-driven, albeit exacerbated by poor policy response.